ROBERT, Louisiana, April 28, 2010 (ENS) – There is five times as much oil spilling into the Gulf of Mexico from the Deepwater Horizon’s undersea wellhead than was originally thought, a Coast Guard official said late tonight. 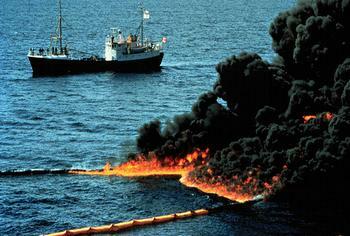 Rear Adm. Mary Landry, the federal on-scene coordinator for the oil rig disaster, told reporters that based on analysis from the National Oceanic and Atmospheric Administration, 5,000 barrels a day are now spilling from the wellhead left open by the explosion and fire that sank the Deepwater Horizon on April 22. To add to the massive oil spill, a third underwater oil leak was detected today in the pipeline that connected the oil rig to the wellhead, said Doug Suttles, chief operating officer for BP, the party that contracted the rig and is responsible for stopping and cleaning up the oil spill. “It’s premature to say this is catastrophic, but I will say this is very serious situation,” said Landry at a news conference this afternoon. Responders using remotely operated submarines have been unable to shut off the flow of oil by manipulating the blow-out preventer, a series of valves that sits at the wellhead. These efforts will continue at the same time as a collection dome is prepared to capture the oil underwater and a relief well is drilled. Both these efforts could take weeks to complete. The federal Minerals Management Service today approved a permit for BP to drill a relief well about half a mile from the well head. Suttles said the drilling will start by Friday. 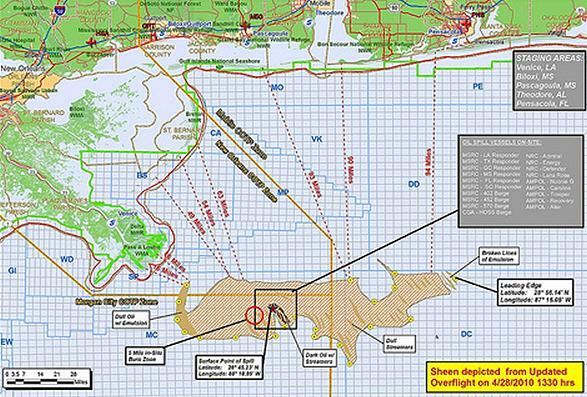 BP is also flying over the spill applying thousands of gallons of chemical dispersants to break up the oily mess. Late this afternoon, patches of surface oil were captured with fire-retardant boom and ignited in a test burn to see if some of the oil could be dealt with in that manner before it reaches the coastline. The massive spill threatens coastal wildlife refuges, beaches, estuaries and shellfish beds in Louisiana, Mississippi, Alabama and Florida. The oil has been drifting closer to shore by the hour and is now located less than 20 miles from Louisiana. At a news conference earlier today, NOAA’s Charlie Henry said the leading edge of the oil plume will be near the Mississippi Delta by Friday evening. At least 100,000 feet of floating oil-containment boom have been deployed as a precaution to protect sensitive areas in the Louisiana area, and 500,000 feet more of the boom is poised for deployment if needed. The Swiss company Transocean Ltd. is the owner of Deepwater Horizon, the drilling rig that exploded and caught fire on April 20 and sank April 22. Eleven of the 126 workers aboard are missing and presumed dead. Contracted by BP, the Deepwater Horizon had been drilling an exploratory well about 42 miles southeast of Venice, Louisiana and workers were in the process of capping and sealing off the well when the pressure suddenly rose and the explosion occurred. The wrecked rig is now located on the sea floor approximately 1,500 feet northwest of the well center, away from any subsea pipelines. The Deepwater Horizon won a safety award from the U.S. Minerals Management Service in 2009, and the agency found no safety violations during three safety inspections this year. The federal government is investigating the cause of the incident, and BP started its own investigation last week.